In a one-dimensional oscillation obeying conservation of energy, the potential function determines the period of motion as a function of dimensionless energy . However, the period function only uniquely determines the potential in the case of parity symmetry, where . In all other cases, it is possible to construct an uncountable infinity of potentials with the same period . Regardless of symmetry, we call any two potentials isoperiodic if they have the same period function . Careful examination of inverse functions leads to a precise definition of isoperiodic potentials using power series expansion . As in , we use a phase-space technique to write as a function of the potential expansion coefficients around a stable minima. 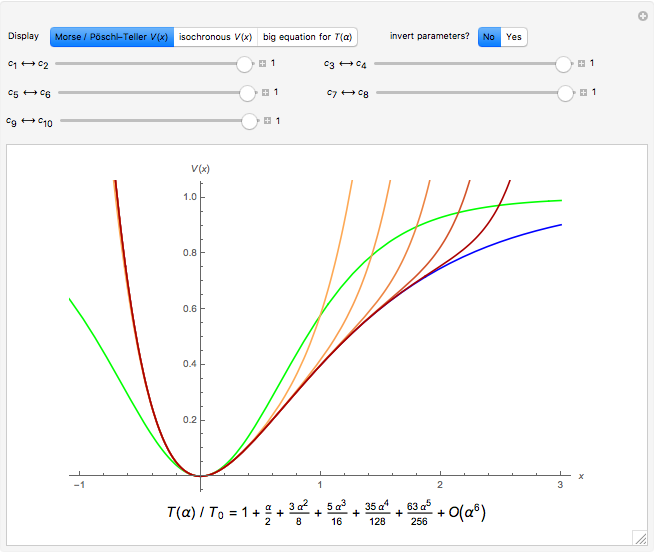 The general form of leads to a set of linear constraints between the expansion coefficients of isoperiodic potentials (see Details). The examples here explore energy-dependent potentials between Morse and Pöschl–Teller, and energy-independent potentials including the familiar quadratic . The validity and convergence of intermediate potentials can be examined again by numerical time evolution along the potential surface. 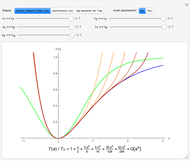 Analyzing the general period function first reported in , we prove that every power of the Hamiltonian energy attaches to a function of the potential expansion coefficients with a pair that does not occur in the coefficient of any with . This fact allows order-by-order construction of isoperiodic potentials as series expansions around a stable minima. Fixing the values and applying the isoperiodic constraint to the yet leaves one continuous degree of freedom in every coefficient . 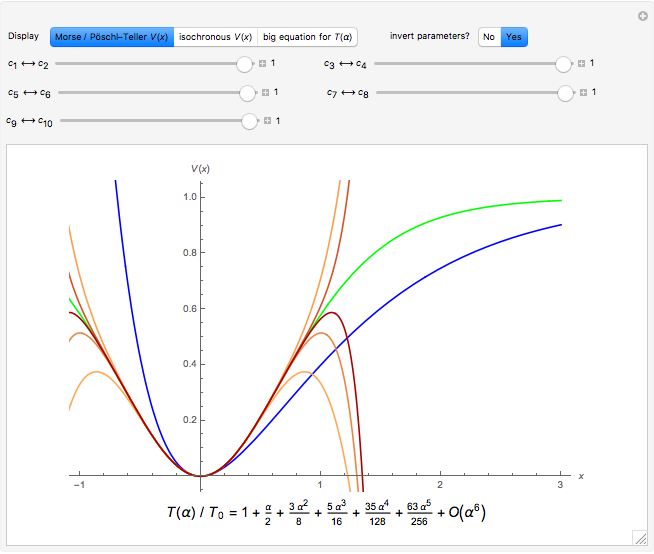 These continuous degrees of freedom are controlled by sliders in this Demonstration, which directly enables you to calculate a range of isoperiodic potentials. 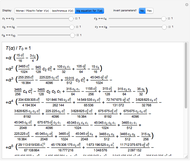 Methods used here have also contributed to award-winning posts on Wolfram Community [5, 6]. M. Asorey, J. F. Cariñena, G. Marmo and A. Perelomov, "Isoperiodic Classical Systems and Their Quantum Counterparts," Annals of Physics, 322(6), 2007 pp. 1444–1465. doi:10.1016/j.aop.2006.07.003. E. T. Osypowski and M. G. Olsson, "Isynchronous Motion in Classical Mechanics," American Journal of Physics, 55(8), 1987 pp. 720–725. doi:10.1119/1.15063. B. Klee, "Plane Pendulum and Beyond by Phase Space Geometry." arxiv.org/abs/1605.09102. 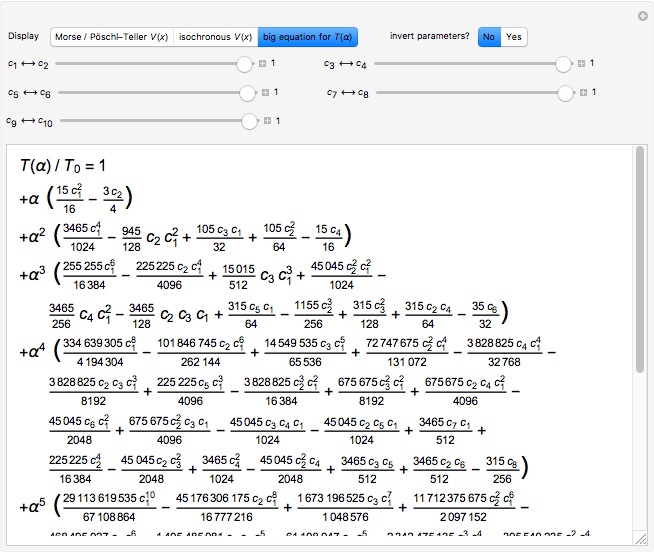 The On-Line Encyclopedia of Integer Sequences. (Apr 4, 2017) oeis.org/A276816. 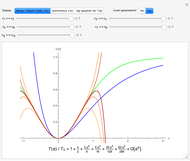 B. Klee, "A Period Function for Anharmonic Oscillations" from Wolfram Community—A Wolfram Web Resource. (Apr 4, 2017) community.wolfram.com/groups/-/m/t/984488. B. Klee, "Plotting the Contours of Deformed Hyperspheres" from Wolfram Community—A Wolfram Web Resource. (Apr 4, 2017) community.wolfram.com/groups/-/m/t/1023763. Brad Klee "Isoperiodic Potentials via Series Expansion"